The final season premiere of Game of Thrones has a lot going on, and we’re obviously not even close to being done processing it. There are family reunions, tense revelations, and clashes over power that are colder than the North in the thick of a long Winter. But of course, the Night King isn’t about to let a party get started without him! Just when we think the craziness of the episode is finally dying down, the undead leave a message for the living in the form of their own grotesque art project, letting everyone know that war is quickly approaching. In one of the last scenes of the episode, Tormund Giantsbane, Beric Dondarrion, Eddison Tollett, and other survivors of the Wall’s destruction, are shown at Last Hearth, which is the home of House Umber. The homestead looks entirely torn up and the group comes across the sight of little Lord Umber, strung up and surrounded by severed human limbs arranged in a familiar spiral pattern. As the men discuss their next move, young Ned’s eyes pop open and he begins shrieking and trying to attack them. Beric lights him on fire with his sword, but he continues screaming for a while afterward until he finally dies (again). If the creepy arrangement of limbs has you scratching your head because you swear you’ve seen it before, you’re not alone. 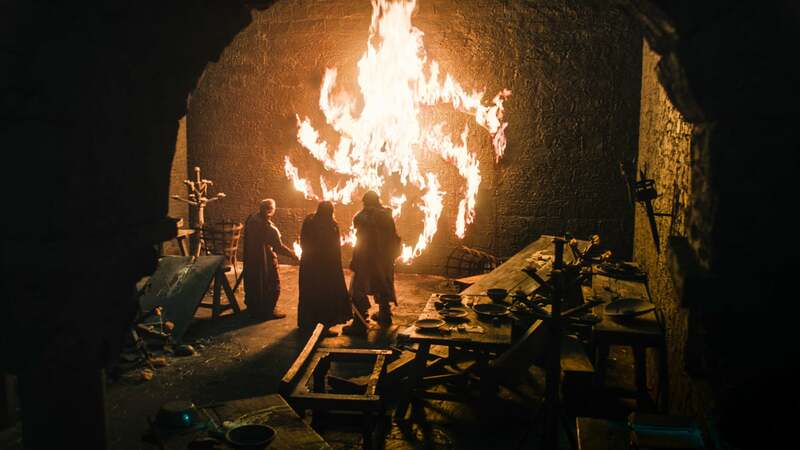 The spiral — and similar symbols — is a familiar calling card of the Night King’s gang of ghouls. It’s first seen in season one, when White Walkers kill group of wildlings and arrange their bodies in the pattern. Jon comes across some of the Night’s Watch horses cut up and arranged in a similar spiral in season three, and also sees the pattern carved into the walls of the caves in Dragonstone, which he reveals to Daeneyrs before they begin mining it for dragonglass. As of the season premiere, there has been no straight answer on what the symbol means exactly; we just know that it’s basically the calling card of the Night King’s army. 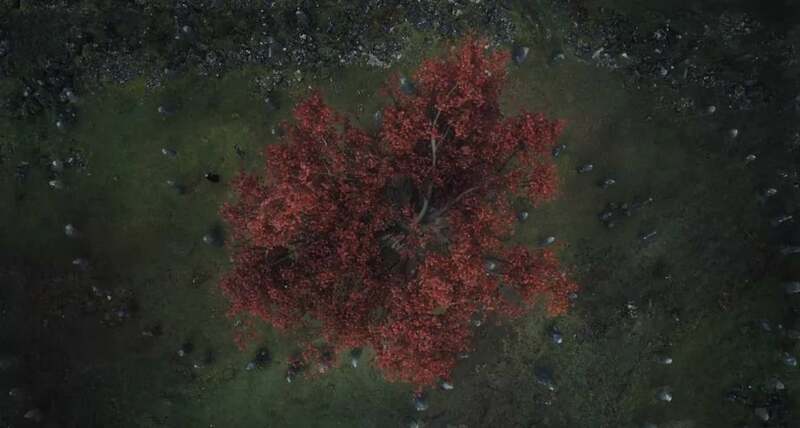 It’s obvious that the pattern meant something sacred to the Children of the Forest, and perhaps had some magical quality to it since they used it when making the Night King. We don’t know if it has the same properties when the undead create it, since all the pattern seems to do now is creep people out. Perhaps we’ll learn if there’s any significance to these symbols in the last few episode of the series, maybe not. There is one thing that’s certain: the Night King is coming for Winterfell and it’s going to be a bloody mess no matter who wins.